Team meetings are organized frequently in organizations to discuss issues. These meetings involve construction up of relationships between the team members.Such discussions involve planning of work, feedbacks given by colleagues, evaluation of results, and coordination of work. 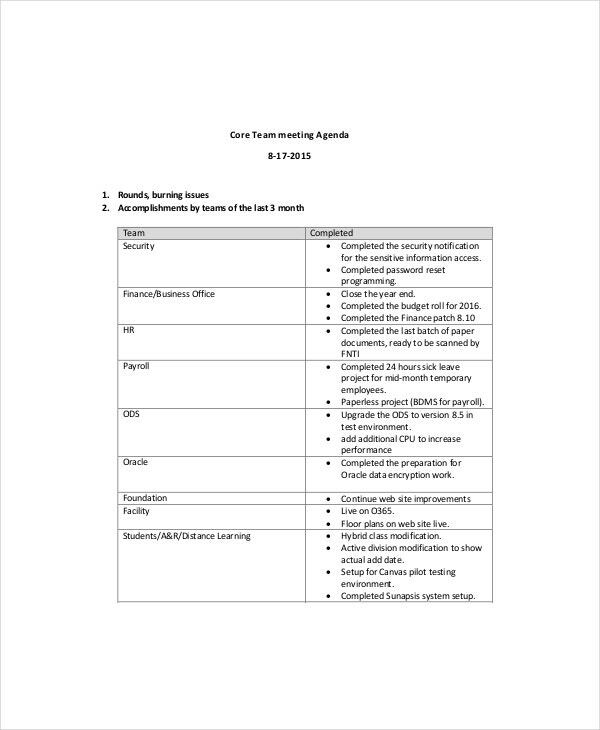 You can also see Blank Meeting Agenda Templates. The team member meetings engross possible innovations in work. The teams get a platform to plan work for further projects discussing innovations and creativity. Evaluation of results and setting of goals is the top priority of such meetings. You can also see Agenda Templates. If any major or minor decision has to be taken by the company which will affect the work type or duration or contribution by team members then such meetings are called. In these congregations significant decisions taken by the company board are declared and the ideas are welcomed for the new move. A team meeting is called in scenarios when a new software/set-up/ collaboration/project/venture has come up in the organization. These meetings involve a brief description of the training sessions to be held. Such meetings are very informative and carried out to make the team aware of the newness of the projects. As soon as a successful assignment finishes the company organizes a meeting for appreciating all the team members who have been a part of the triumphant project. These meetings include an event chair who on behalf of the complete organization congratulates the team and even give fun vouchers or gifts to value the work. The team members are called to seek contribution from the team members. Such meetings have an assignment to begin and before taking up new projects they discuss about the ideas from teams. This gives the team ample time to converse thoughts or opinions so they can inquire about it to the board. 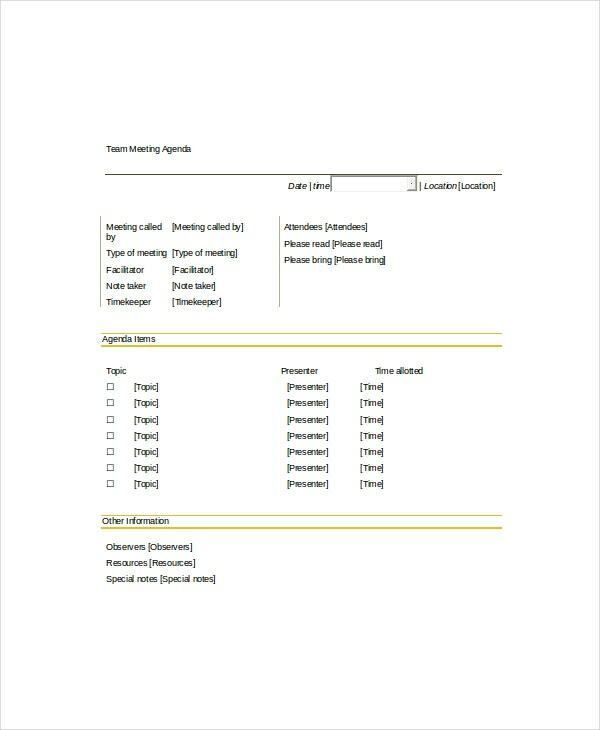 > How to create Team Meeting Agenda Template ? 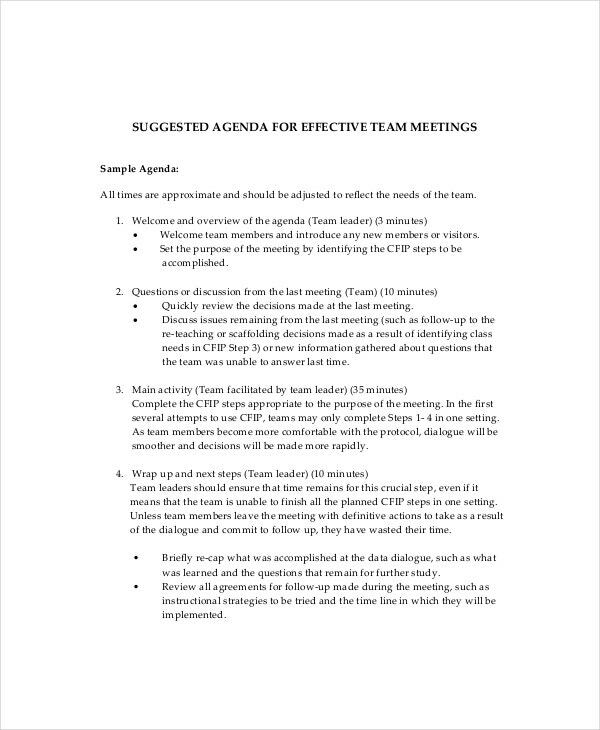 To create a team meeting agenda template finalizes the prime objective of the company. 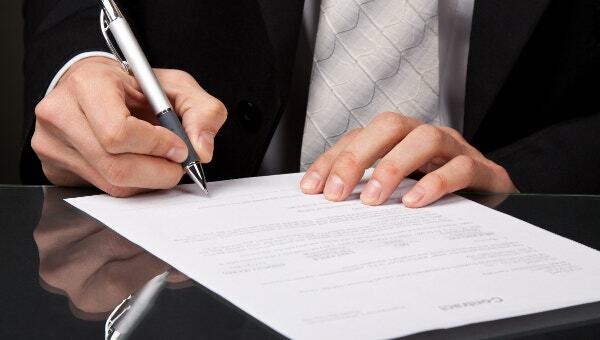 Now list out the time interval to be allotted from introductory session to conclusion. Then you have to allot time slots for the introductory speech of the event chair. 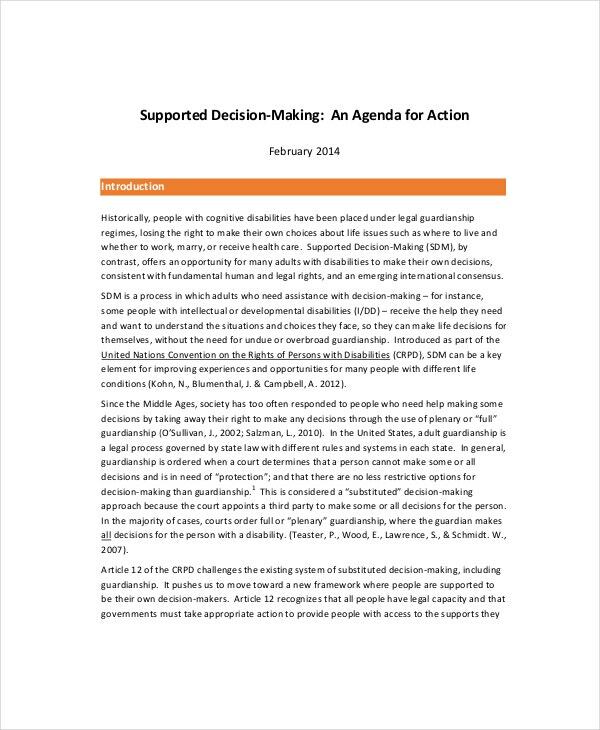 Identify who will be responsible for heading the meeting and make available some information to the associates attending about the topic of meeting. Time allocation, prior information, and clear objectives, necessary information about recent projects on which the team is working on should be specified. You can also see Agenda Planner Templates. 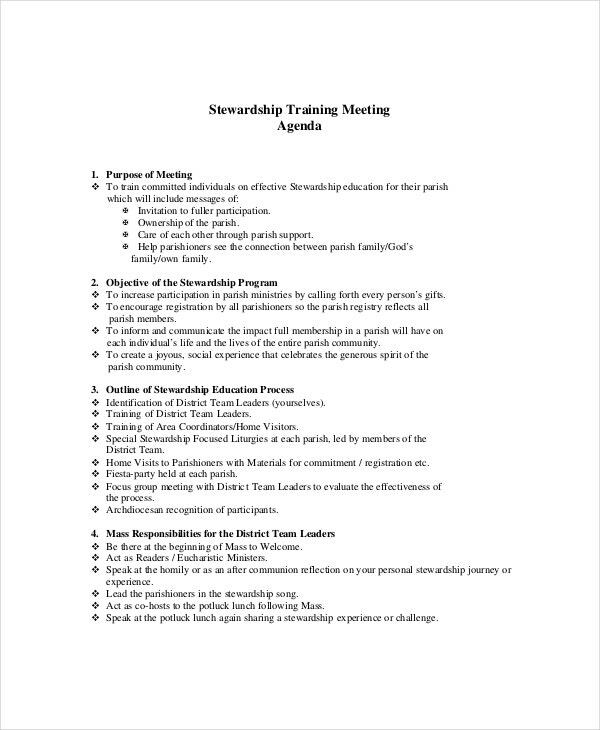 > What is Team Meeting Agenda Template? 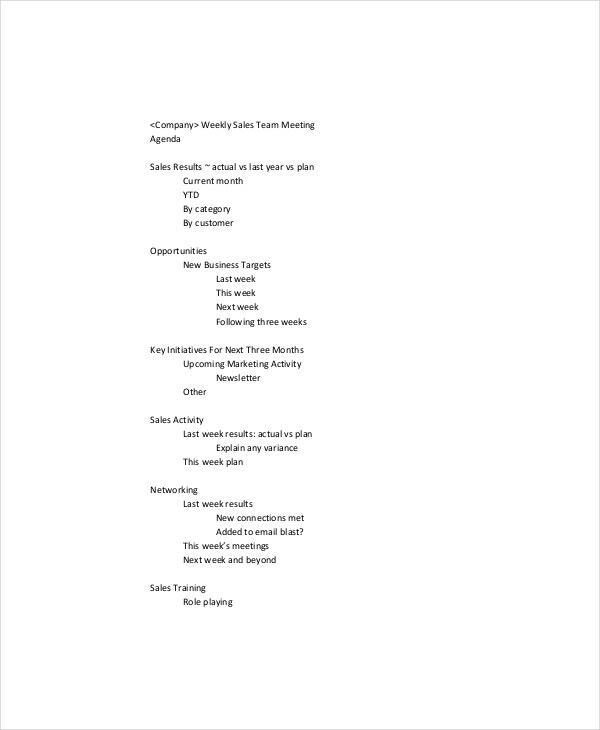 Team meeting agenda template gives you all the necessary information who need to have before starting a team meeting. The teams are initially informed about the meeting. 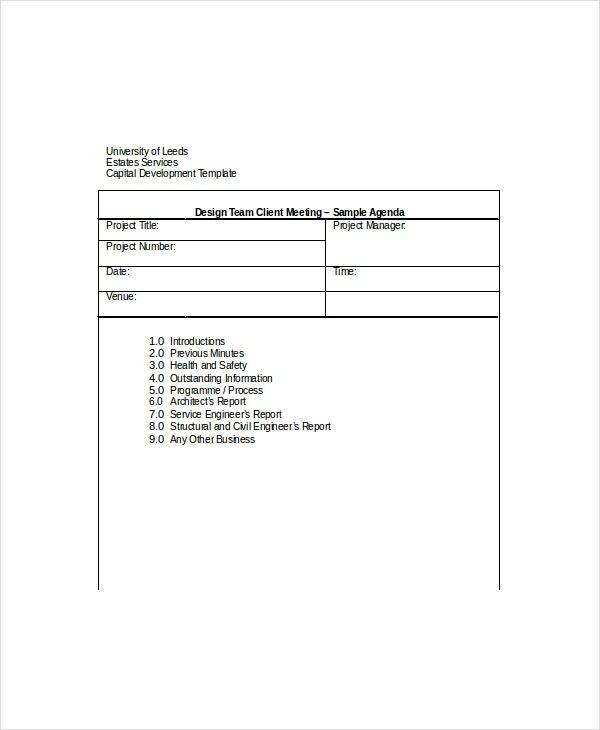 The template gives you space for maintain specific remarks about the meeting so that you remain clear with the meeting’s objective. The time crunch had to be handled carefully as teams are working on multiple projects at same time so you have to allot little time for every member. These meeting are very productive and effective. They boost up enthusiasm in team members and instill a zeal to work effectively. The templates help you to keep names of all team members and the problems they are facing in any project. 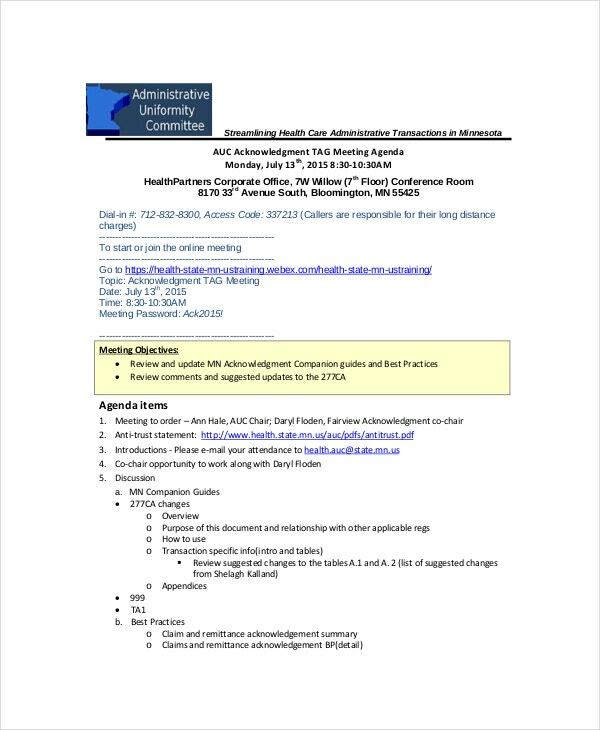 > Why is Team Meeting Agenda Template Important? 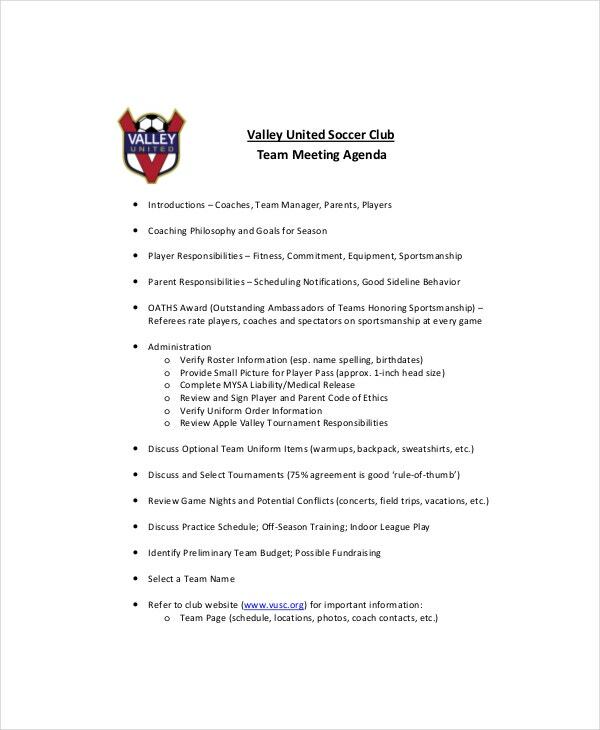 You should keep a team meeting template with you before you start any team discussions. It maintains a record of all the meeting happening during a running project. Weekly team meetings imbibe motivation in team members. Such templates provide you will all issues, problems, upcoming trainings to be discussed in meeting. 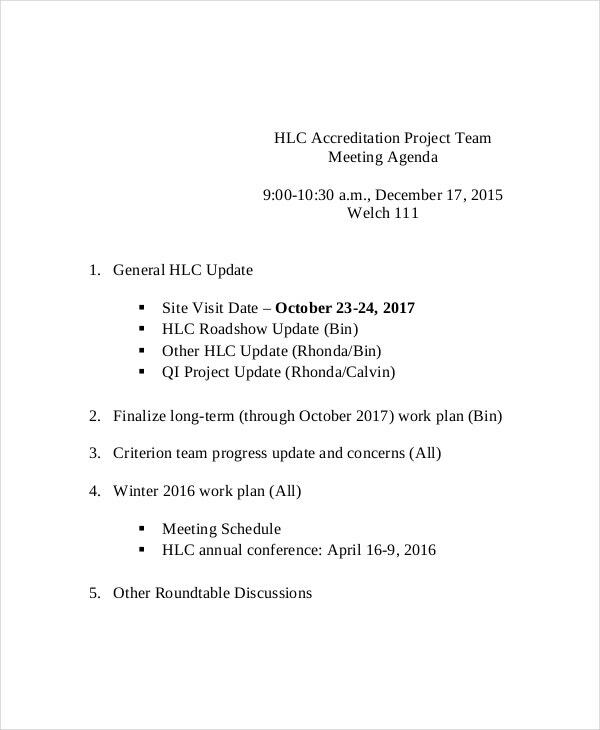 You can also see Board Meeting Agenda Templates.